Social media has proved to be a great equalizer and is probably the best thing that ever happened to the free world. Any civil agitation grows manifold bigger when backed by support on social media. UPA government, which has been ruling India for past 8 years, seems to have a lot of difficulty in swallowing the ever increasing criticism among netizens for their policies. Now, with the help of technology, you can criticize the powerful and broadcast your views to the whole world. You don’t need to throw-a-shoe, neither you criticize an unfair policy over a cup-of-tea in your drawing room – instead, you tweet it. Advent of social media has given a mouthpiece to every common man who has an opinion and an internet connection. Common man has an audience now. Would the political class accept this development? That is the big question. Your voice and its reach is clearly counterproductive to the motives of an average office-holder. It’s like a population of over a billion citizens constantly breathing-down his neck to make sure he does the right thing. That is clearly inconvenient for somebody whose conscience is not clear. A government which can’t even allow people to speak openly, passing a strong ombudsman (lokpal) can be considered a distant dream. Social media is a bone that modern governments can neither spit nor swallow. 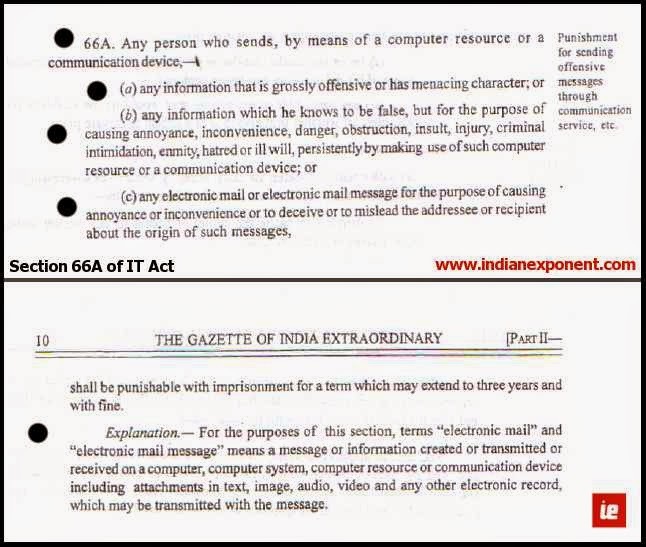 This gave birth to the controversial Section 66A. Here’s one fun fact, this amendment was passed in the parliament in 2008, without even a discussion, which means, no attention was paid to the fact that this law clearly lacks legal and procedural safeguards to prevent violation of civil liberties of Indians. Was this deliberate? According to this law, anybody whom law enforcers find “grossly offensive” online can be booked instantly. The question is, who decides what’s offensive? The law is deliberately worded so vaguely to favor the powerful misuse it per their convenience. April 12, 2012: Professor Ambikesh Mohapatra was arrested for circulating a picture spoof on Trinamool Congress boss Mamata Banerjee. September 9, 2012: Cartoonist Aseem Trivedi was arrested on charges of sedition, for drawing India’s national emblem of the four Sarnath lions of King Asoka as bloodthirsty wolves. Oct 30, 2012: Ravi Srinivasan was arrested for posting a tweet to 16 followers saying that Karti Chidambaram, son of finance minister P Chidambaram, had “amassed more wealth than Vadra”. Nov 19, 2012: Two girls from Palgarh arrested for comments on Facebook criticizing the shutdown in Mumbai during the funeral of Shiv Sena president Bal Thackeray. Nov 28, 2012: Sunil Vishwakarma, a student, was handed over to the Palghar police by MNS activists for his alleged abusive comments against Maharashtra Navnirman Sena (MNS ) leader Raj Thackeray. As you notice all these people are common people – they’re no Sardesais or Dutts – they’re mango people, who merely expressed their frustration with the current system. Taking legal action against them for speaking their mind in a public forum symbolically conveys very firmly to the common people that “chhota muh badi baat” won’t be overlooked. Politicians may throw allegations against each other in the ugliest of words. But a tweet by a common man is too big a thorn in the foot of the goliath. 66A is a message from the disgruntled parliament of our banana republic to the mango men … “We’re big and powerful, and you’re small and unimportant, hence we’re right and you’re wrong. If you dare to speak against the government, be ready to suffer.” Irrespective of who’s wrong or right, in all certainty, somebody with power and resources has all the tools made available by this law to harass commoners for simply exercising their fundamental right of freedom of speech. This is exactly what happened in case Ravi Srinivasan, who tweeted that Chidamabaram’s son should be investigated for amassing more wealth than Vadra. Palgarh girls were merely booked for highlighting the inconvenience caused by bandh issued by Shiv Sena on Bal Thackeray’s death. This issue was not resolved yet, when another student was arrested in Palgarh for negative comments about MNS. While these people were booked for nothing, not a single action has been taken by the ruling governments in Maharashtra against the muscle-politics of Shiv Sena and MNS for years. Actions of these parties have constantly challenged basic civil rights of speech and movement ensured under the same Article 19 (1) under which these arrests were made. Why no urgency in resolving the menace spread by Shiv Sena and other similar political parties in India? People have started voicing their opinions on social media now, but these parties have been harassing public life for ages. Have we forgotten Mangalore pub incidents or, the harassment of media channels and movie-makers? Exceptions hold ONLY in the EXTREME cases of security of the State, friendly relations with foreign States, public order, decency and morality, contempt of court, defamation, incitement to an offence, and sovereignty and integrity of India. And if you read the list again, all the above exceptions are regularly and openly flouted by the political parties. Shiv Sena and MNS are the worst offenders. People of Maharashtra should ask themselves and their government if the constitution is still valid in that state. Who gives these parties the right to hold the whole state a hostage of their whims and egos? Another point to notice is that our constitution ensures freedom of speech in every media. There’s no need to separately watch social media. When somebody expresses their opinion online, and criticize a public servant, they’re exercising their fundamental right. If the government stops you from doing that then the government is unconstitutional and unlawful, not you. We’re not a banana republic and fair criticism and tolerance are a foundation of the democracy. If the government is going to throttle and not going to be tolerant, it shows a sign of a government that is very worried, that wants to repress the public. Though, it’s a fact that the protection of freedom of speech in India is nowhere near as strong as it is in the US. If you want to victimize a person there are tools and machinery available which you can use in India in the name of law. A responsible government would make amendments in the constitution to further strengthen the freedom of speech in India, instead of sneakily trying to curb it.